My best friend Nichole turned me on to Tapioca Pudding about 6 years ago. She is an amazing cook and I love everything she makes, but I really love her incredible homemade desserts! I’ve been wanting to make a good Old Fashioned Tapioca Pudding with coconut milk for quite some time. I’m so glad I finally did and I love the addition of chocolate to the original recipe. This is linked to Allergy Free Wednesdays, Tasty Traditions, Cast Party Wednesday, Waste Not Want Not Wednesday, Hearth & Soul Hop, Slightly Indulgent Tuesday, Fat Tuesday, Creative Corner, Better Mom Mondays, Thank Your Body Thursday, Whole Food Fridays, Inspiration Gallery, Pennywise Platter, Simple Lives Thursday and Live Laugh Linky. Place tapioca in water for 30 minutes in a medium size saucepan. After 30 minutes, add to the tapioca, coconut milk, almond milk, salt, ¼ cup coconut sugar and lightly beaten egg yolks. Stir over medium heat until boiling. Simmer over low heat for 10 more minutes, stirring frequently. Add in chocolate powder. Beat egg whites with remaining ¼ cup coconut sugar. Slowly fold mixture back into pan and stir over low heat for 3 more minutes. Cool pudding for 10 minutes and add in the vanilla extract. Enjoy warm or chilled. Add toppings such as shredded coconut, strawberries and raspberries. You know me, I can’t make a lime recipe without trying a lemon version of it too! And dare I say this pudding is better than the lime pudding. Or perhaps, I just love lemons a little more deep down. The whole pudding idea came into my head as I have been trying to think of creative snacks to feed my kids in between school and activities. My daughter starts Kindergarten in just a few short weeks. And although she will only go to school half-days in the afternoon, I know she will come home “starving” as she puts it. Having a snack ready ahead of time (or one I can whip up in a few minutes), will make life a lot easier on all of us. This pudding is jam packed with healthy fats, good for growing brains and balancing glucose levels. It also contains a large amount of Vitamin C from antioxidants in the lemons. I have to admit I had leftovers of this pudding from last night and I ate it for breakfast. Yep, it was THAT good. Blend on high for 2 minutes. Place container in the refrigerator for 1 hour to chill. Serve and enjoy! Optional-Top with coconut flakes and lemon slices on top. This is linked to Gluten Free Tuesday, Unprocessed Fridays, Wildcrafting Wednesday, Cast Party Wednesday, Melt in Your Mouth Monday, Monday Mania and Friday Food, Freaky Friday, Fit and Fabulous Fridays, Fresh Bites Friday, Whole Food Fridays, Keep It Real Thursdays, Full Plate Thursday, Pennywise Platter, Tastetastic Thursday, Gluten-Free Wednesdays, Frugal Days, Sustainable Ways, Real Food Wednesday, Allergy-Free Wednesdays, Tasteful Tuesday, Fat Tuesday and Slightly Indulgent Tuesday. Coconut paired with Lime? Bliss. At least in my book. And it is oh so refreshing on a hot Summer day like today. Blend on high for 1 minute. Enjoy immediately or chill in the fridge for one hour. Optional-top with shredded coconut and a few lime wedges. 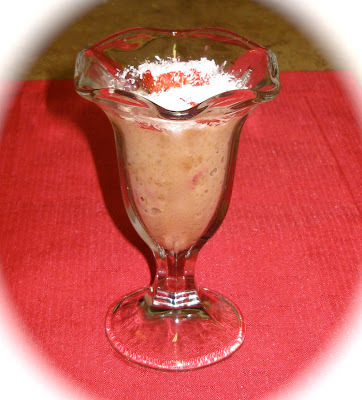 This pudding is so easy to make. It is made of simple, wholesome ingredients without sacrificing flavor or taste. I believe healthy fats are critically important in one’s diet. Although my four year old loves to eat, she never sits down for long–she’s always off to dance, do a puzzle, you name it! I try to make sure what she eats is packed with fiber, healthy fats and protein–even when she is eating dessert. I loved making this recipe with my daughter as she got so excited that she was going to make pudding with an avocado. Avocados are loaded with Vitamin C, fiber, potassium and healthy fats. Coconut milk provides lauric acid, a superb immune booster that is often missing in the foods we eat today. Raw cacao powder provides iron, magnesium and protein. To top it off dates are rich in B Vitamins and fiber. So treat yourself today to this tasty pudding! Remove pits from dates. Blend on high for 3 minutes. Scoop into serving dishes. Enjoy! It is also good chilled after being stored in the refrigerator. This is linked to Tasty Tuesday Party, Real Food 101, Mix it up Monday, Lunchbox Love, Freaky Friday, Friday Food Flicks, Fight Back Friday, Wellness Weekend, The Mommy Club, It’s a Keeper Thursday, Tastetastic Thursday, Pennywise Platter, Full Plate Thursday, WLWW, WFMW, Frugal Days, Sustainable Ways, Gluten-Free Wednesdays, Midweek Fiesta, Allergy-Free Wednesdays, Hearth and Soul Blog Hop, Totally Tasty Tuesdays, Slightly Indulgent Tuesday, Make Your Own Monday, Things that make you say Mmmm!, Barn Hop, Melt in Your Mouth Monday, My Meatless Mondays, Monday Mania, Better Mom Mondays, The Sweet Spot, Inspire Me Monday, Seasonal Sundays and Sunday School. I am very happy to once again be participating in The Holiday Recipe Club organized by Erin of the Big Fat Baker. It is a wonderful event in which a group of us bloggers come together and create our own recipes. 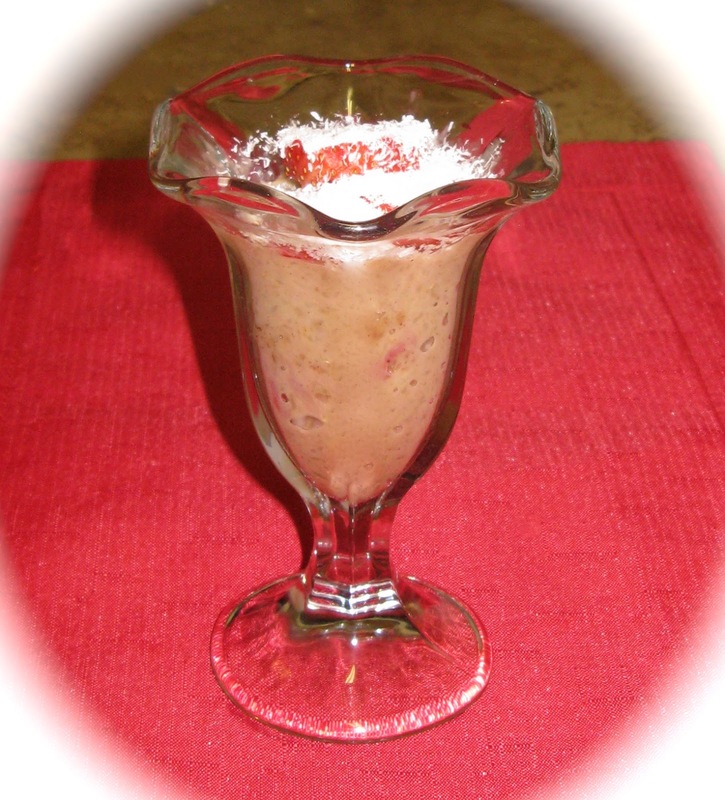 For this event, we were asked to create a recipe that incorporated at least one of these ingredients in it: strawberries, beef and/or heavy cream. I chose to go with strawberries as I felt like it was the food that most represented Valentine’s Day. Strawberries are red, sweet and heart healthy. Strawberries are a favorite in my family. Whenever I put them in a dessert, the dessert is gobbled up. Fortunately, this recipe was no exception. Have you ever had rice pudding? I’m a huge fan of it. I make a dairy-free version of it several times a year using coconut milk and raisins. 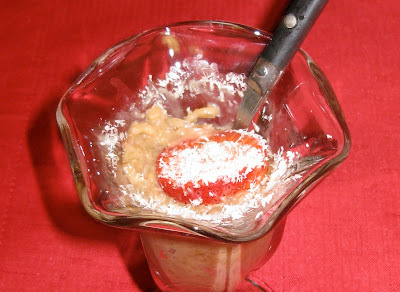 The replacement of strawberries and addition of coconut to the traditional pudding recipe makes this pudding amazing. Seriously. My daughter ate it last night for dessert and woke up this morning and begged to eat it again for breakfast. I gave in because it sounded really good to me too! So what makes this treat good for you? Strawberries are an excellent source of antioxidants, Vitamin C, manganese, fiber and folate. Brown rice provides protein, fiber and iron. Cinnamon helps normalize blood glucose levels and coconut milk is rich in lauric acid which is one of nature’s most potent, natural immune boosters. Place rice, coconut milk, sugar, vanilla, flavoring and cinnamon into a large pot and cook over medium low heat for 10 minutes. Stir frequently. Reduce heat to low and add in 1 cup of the sliced strawberries. Stir well and cook for 5 more minutes or until the pudding has thickened. Remove pot from heat and let cool for 15 minutes. Place pudding into serving dishes and top with the strawberries and shredded coconut. I love participating in this event alongside so many talented bloggers because I never know what wonderful recipes the other participants are going to create. It’s such a fun surprise! This recipe is linked to Gluten-Free Wednesdays, Strut Your Stuff Saturday, Allergy Friendly Friday, Full Plate Thursday, Midweek Fiesta, Tempt My Tummy Tuesday, Slightly Indulgent Tuesday, Inspire Me Monday, Wellness Weekend and Seasonal Inspiration.